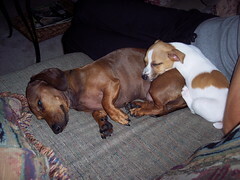 Snoozing Puppies » Blog Archive » get this guy off me! get this guy off me! This entry was posted on Friday, December 14th, 2007 at 7:22 pm	and is filed under Uncategorized. You can follow any responses to this entry through the RSS 2.0 feed. You can leave a response, or trackback from your own site. A powerful share, I simply given this onto a colleague who was doing slightly evaluation on this. And he actually purchased me breakfast as a result of I found it for him.. smile. So let me reword that: Thnx for the deal with! But yeah Thnkx for spending the time to debate this, I feel strongly about it and enjoy studying more on this subject. If attainable, as you become experience, would you mind updating your weblog with extra particulars? It is really beneficial for me. Massive thumb up for this weblog put up!